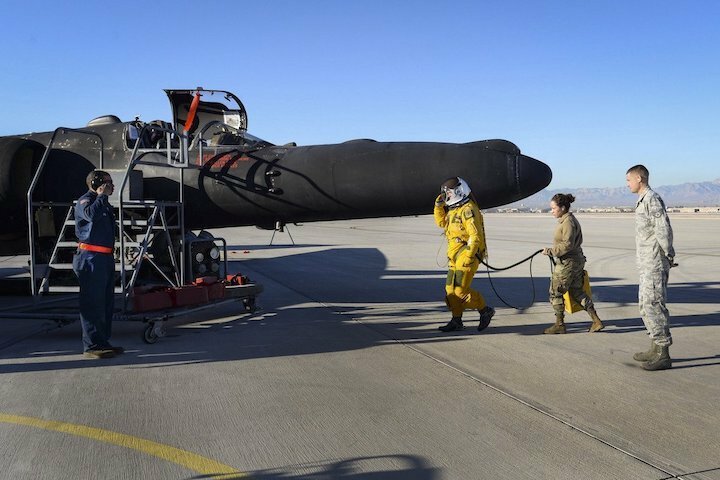 Gliding over the skies of Southern Nevada at an altitude of approximately 70,000 feet, an all-black, single jet engine aircraft dubbed the Dragon Lady travels to Nellis Air Force Base, Nevada. The Lockheed U-2, assigned to Beale Air Force Base, California, is an ultra high-altitude reconnaissance aircraft that provides day and night, all-weather intelligence gathering. The U-2 traveled to Nellis to take part in the Weapons School Integration (WSINT); a series of complex, large-force employment missions that served as the capstone portion of the U.S. Air Force Weapons School courses. The aircraft pilot’s view was limited due to the restricting helmet and suit worn while in flight. The purpose of the chase car is to ensure a safe landing for the aircraft and pilot, said Capt. Joseph, WSINT participant and U-2 pilot assigned to the 19th Weapons Squadron. The wheels of the U-2 have to touch the ground at the same time due to the bicycle-style landing gear or it could bounce and possibly damage the aircraft.